The Oscars are approaching, and if you're anything like me, watching those gowns go down the red carpet is just as exciting as the actual awards! Now, with the help of RentTheRunway.com, you can grab some of the same dresses and designers as your favorite celebs! Want to dress to impress for an upcoming event--wedding? party? class reunion? Now you can for a FRACTION of the price!! Head on over here to Mamapedia Sweet Deals and sign up to receive a FREE $5 credit for you to put toward this sweet deal! Today you can purchase quite a deal: $100 worth of rentals--using your $5 sign-up credit knocks the price down to $35!!! What a deal! I know I always am running around at the last minute looking for something to wear for weddings. I always end up paying at least 3 times this much and only wear it once! This year, I will be decked out in Badgley Mischka, Hervé Léger, Theory, Angel Sanchez or Nicole Miller! This Milly dress would be perfect for a summer wedding and retails for $350. I could rent it for $50--and still have $50 left over to rent some accessories!! This Robert Rodriguez Black Label retails for $795!! It is $100 to rent...but if I use my coupon, I can snag it for $35----that's 5% of the retail value!!! Have a black-tie event and looking for something fancier? 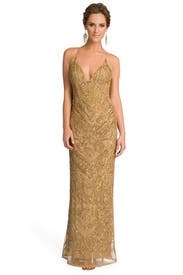 This Nicole Miller dress retails for $1,200 and rents for $150. Using your coupon, you can grab the whole look for $85. Less than $100 for a black-tie event?!? That's a steal!!! If you have an event to go to this year, you may be dreading shopping for it (and spending so much money)...RentTheRunway sends 2 sizes with every rental--so you'll never have to worry about ordering the "right" size! For $35--this is a hard deal to pass up! I'm going to feel like Cinderella. If you're interested in this be sure to grab it today because this deal expires at midnight.